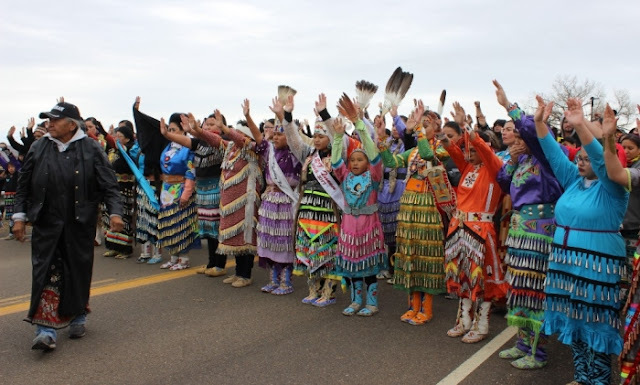 About 150 men, women, and children set out on foot from Oceti Sakowin camp, near the Standing Rock Sioux Tribal Reservation. In the lead, wearing a headdress of stunning long white feathers tapering into black, is Lakota Chief Arvol Looking Horse, spiritual leader of the Sioux Nation. The colorful flags of hundreds of tribal nations proudly wave on tall makeshift poles, lining either side of the self-described “water protectors” path. Under grey and cloudy skies and a fresh cold spell, the mood is somber. The jingle dress originated from the Ojibwe, “our first nation, and this is where we get our teachings from,” she says. 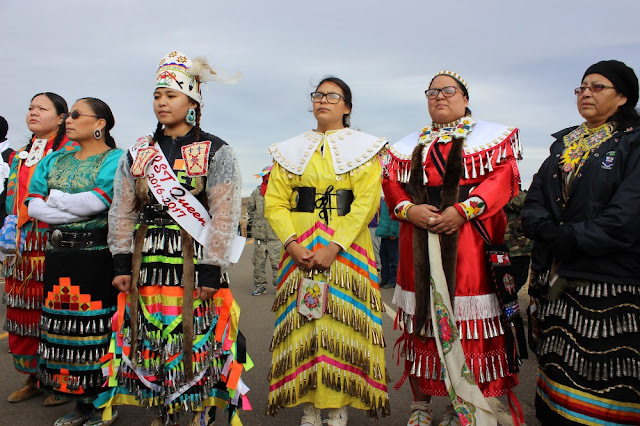 Responses to "Jingle Dress Dancers bring healing and prayer to Water Protector Camp"
So heartening to see the indigenous peoples coming together in peace of the common good.